A Homemade Soy-Free Alternative This black bean miso paste recipe is an American-style miso or "modern miso", a non-traditional version utilizing black beans as opposed to the customary soybean selection. 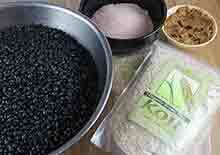 It is made the same way you would make Asian varieties; you simply substitute black beans instead of soy. This can not only be a preferred option for those trying to avoid soy products, it also tastes absolutely delicious using this legume option. When making a homemade miso paste, is important to know going in that there is a good amount of waiting required.